Dr. Devereaux and his associates are to be congratulated on identifying a new disease entity, MINS (myocardial injury after noncardiac surgery), and now giving us a way to treat it. MINS is extremely common and quite morbid, and there had never before been a trial that studied its treatment. Identifying patients with MINS is extremely important. These are very-high-risk patients, and they are very hard to find. The results from MANAGE give us a way to do something about MINS and an opportunity to improve patient outcomes. The etiology of MINS puts the responsibility primarily on surgeons to diagnose and treat MINS. I hope the message will reach surgeons about MINS and how it can be treated. It does not seem practical for cardiologists to play a role in most of these cases. I also have some concern that, while surgeons are the logical clinicians to diagnose and treat MINS, they also might feel some disincentive to identify patients who develop an initially asymptomatic complication because of the surgery they have undergone. Pamela S. Douglas, MD , is a cardiologist and professor of medicine at Duke University in Durham, N.C. She had no disclosures. She made these comments as a discussant for MANAGE and in an interview. ORLANDO – Treating patients who developed myocardial injury after noncardiac surgery with the anticoagulant dabigatran significantly cut the rate of subsequent major vascular complications in a randomized, multicenter trial with 1,754 patients, a result that gives surgeons and physicians the first evidence-based intervention for treating a common postsurgical condition. “Because we have not systematically followed noncardiac surgery patients, it’s easy to presume that everyone is okay, but all the epidemiology data show that these patients [who develop myocardial injury after noncardiac surgery] don’t do okay. We need to be aggressive with secondary prophylaxis,” P.J. Devereaux, MD, said at the annual meeting of the American College of Cardiology. 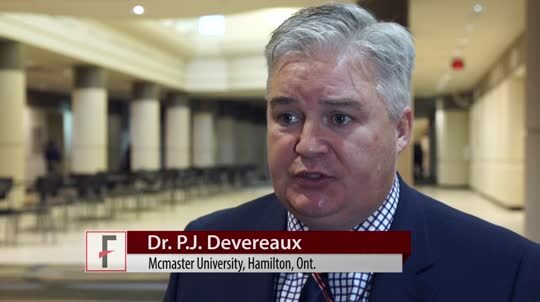 “The unfortunate thing is that right now, we don’t do much for these patients,” said Dr. Devereaux, professor of medicine and director of cardiology at McMaster University in Hamilton, Ont. Results from prior epidemiology studies have shown that, among the roughly 200 million patients who undergo noncardiac surgery worldwide each year, 8% will develop MINS (myocardial injury after noncardiac surgery) (Anesthesiology. 2014 March;120:564-78). The myocardial injury that defines MINS is identified by either an overt MI that meets the universal definition, or an otherwise unexplained rise in serum troponin levels from baseline in the first couple of days after surgery. In the new study, Dr. Devereaux and his associates identified 80% of MINS by a troponin rise and 20% by a diagnosed MI. The challenge in diagnosing MINS and then administering dabigatran will be implementation of this strategy into routine practice, commented Erin A. Bohula May, MD, a cardiologist at Brigham and Women’s Hospital in Boston. “The problem is, troponin is not routinely measured in postoperative patients. It will be hard to change practice,” she noted.